The next World Congress of AIMS will be held in Tallinn (EST) from 6-8 September 2018. Any member wishing to apply to host the 23rd World Congress of AIMS, sometime between March 2020 and February 2021, should contact the AIMS secretary (aimssec@aol.com) for Congress guidelines and an application form. 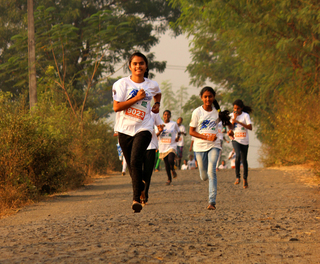 The final event of 2017 was held on 26 November in Khanivali (IND) a small village about 80km north of Mumbai. This year the course was changed from out-back to become point-to-point, allowing more children to be included. There were three age groups both for boys and girls, the children being from grades 8, 9 and 10. A total of 610 registered and 550 participated. 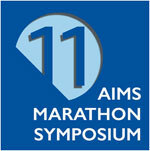 A short summary of presentations at the 11th AIMS Marathon Symposium appears here. 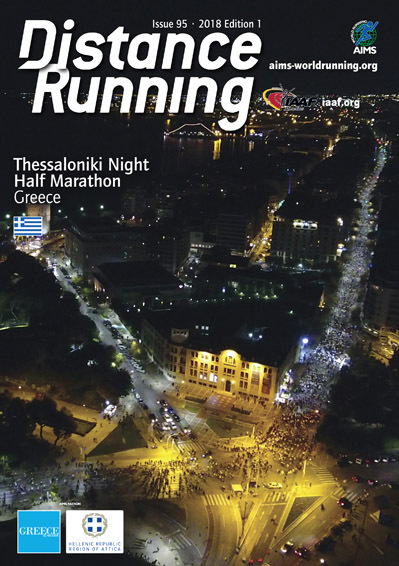 The Hellenic Athletics Federation, the Athens Authentic Marathon and the Region of Attica are co-organisers of all these events which are sponsored by the Greek National Tourism Organisation and Athens International Airport. The International Institute for Race Medicine (IIRM) is the medical advisory body to AIMS and two of its Board members, Chris Troyanos and George Chiampas, are directly available to AIMS as advisors. IIRM offers membership to AIMS member races at an introductory rate of $100 for one year. For a limited time members can apply for a grant to cover the one-year membership. Up to 100 eligible events will be awarded such grants provided by the UK-based Matthew Good Foundation (MGF). AIMS members should not negotiate the entry or participation of any Russian athletes or support personnel (agents, coaches, etc.) in their races but: “In principle, ordinary fun runners with absolutely no ties to the Russian Federation are eligible to participate.” It is best to explicitly identify the participation of any ‘eligible’ Russian runners in advance of the race being held to avoid any misunderstanding with media outlets. A recent inquiry from Comrades Marathon has highlighted the need to define an ‘ordinary fun runner’ as a Russian place-winner in the women’s race completed the course at 5min/km pace. Further advice is being sought from IAAF. The SSQ Quebec City Marathon (CAN) will take place on Sun 14 October 2018, not Sun 26 August 2018 as previously published. The Tokushima Marathon (JPN) will take place on Sun 25 March 2018, not Sat 24 March 2018 as previously published. The Marathon Vert D’Agadir (MAR) will take place on Sun 15 April 2018, not Sun 22 April 2018 as previously published. The AUDIREVI Lake Maggiore Half Marathon & 10km (ITA) will take place on Sun 4 March 2018, not Sun 11 March 2018 as previously published. The Madagascar Marathon & Half-Marathon (MAD) will take place on Sat 9 June 2018, not Sun 17 June 2018 as previously published. The Econet Victoria Falls Marathon (ZIM) will take place on Sun 1 July 2018, not Sun 17 June 2018 as previously published. The Tata Consultancy Services World 10K Bengaluru (IND) will take place on Sun 13 May 2018, not Sun 20 May 2018 as previously published. The Gammon China Coast Marathon and Half Marathon (HKG) will take place on Sun 28 January 2018, not Sun 21 January 2018 as previously published. To update your email address, click the “Update subscription preferences” link at the bottom right of this newsletter. Edition 1 of 2018 is being distributed. The advertising deadline for Edition 2 of 2018 will be on 9 March. iv) addresses at which to receive bulk deliveries of Distance Running. It is possible that these requests may be diverted into the member race organiser’s spam folder. Please be alert to this possibility and, if you are not receiving Gary’s messages, be pro-active in providing details and making bookings for advertisements in Distance Running. IMPORTANT: When sending material to any of the above expos please ensure that it arrives during the week of the race, so that the host organisation can minimize the need for storage. Copyright © 2018 AIMS World Running, All rights reserved.